Eleventyseven is an American electronic rockband from Laurens, South Carolina, formed in2002. They chose the name "Eleventyseven" because "it's the one that looked cool the next morning". The band is currently independent, but previously released two albums on Flicker Records. They continue to tour, self produce and release music independently. Group members Matt Langston and Caleb Satterfield first played together in a church group from Greenville, South Carolina. After adding drummer Johnathan Stephens, the band began by playing shows in their hometown when they were in high school. They self-released a full-length album and several EPs, which caught the attention of Flicker Records, aSony/BMG subsidiary distributed throughProvident Label Group. Their major-label debut, And the Land of Fake Believe, was released on May 16, 2006 to mixed reviews. 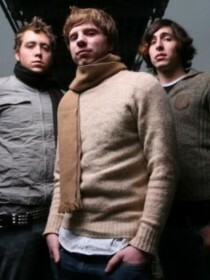 Following the release of the album, the group appeared at Shoutfest '06, gained exposure on MTVU and had success at Christian rock radio with the single "MySpace"; their profile on said website became very popular as a result. Their single "More Than A Revolution" reached the Top 5 in ChristianRock.Net's weekly Top 30, and #28 in their annual Top 100, as well as topping the Radio & Records Christian Rock charts. After an appearance on The Logan Show on November 25, 2006, the group announced plans to tour the US in the early months of 2007. Their second album for Flicker, Galactic Conquest, was released on September 4, 2007. 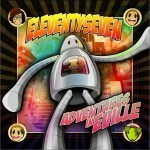 Eleventyseven released their newest album, Adventures in Eville, on June 30, 2009. Eleventyseven released the new EP "Quota" on April 1, 2011. They continue to tour the U.S. regularly. Lead singer Matt Langston formed an entireley electronic side project called The Jellyrox in 2010. He continues to write, record and produce for both acts, as well as other bands.